Alumni in Class of 1946 H.S. Class of 1946. Elaine Allred. She graduated from BYH on May 23, 1946. Source: 1946 BYH Graduation Exercises Program. She wrote a poem, "At the Crossroads" which she performed during graduation exercises along with five classmates: Clair Anderson, Robert Morgan, Montez Jones, Fred Baird, and LaDean Anderson. Class of 1946. Clair R. Anderson [male]. He graduated from BYH on May 23, 1946. Source: 1946 BYH Graduation Exercises Program. Class of 1946. LaDeane Anderson. She served as Student Body Secretary-Treasurer in 1945-1946. She graduated from BYH on May 23, 1946. Source: 1946 BYH Graduation Exercises Program. 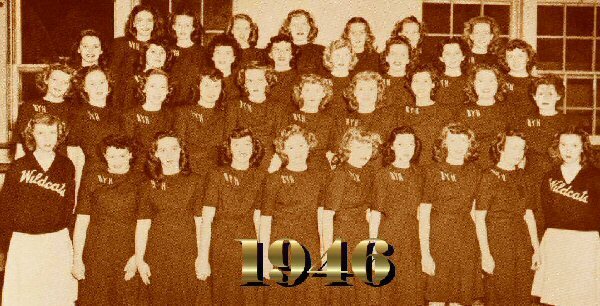 Class of 1946. Barry Hulet Avery. He graduated from BYH on May 23, 1946. Source: 1946 BYH Graduation Exercises Program. Class of 1946. Leora Behrman. She graduated from BYH on May 23, 1946. Source: 1946 BYH Graduation Exercises Program. Class of 1946. Randa Marie Bentwet. She graduated from BYH on May 23, 1946. Source: 1946 BYH Graduation Exercises Program. ~ ~ ~ ~ She married _____ Mette. Class of 1946. Innis Faun Boren. She graduated from BYH on May 23, 1946. Source: 1946 BYH Graduation Exercises Program. Class of 1946. Elizabeth Brandley. She graduated from BYH on May 23, 1946. Source: 1946 BYH Graduation Exercises Program. ~ ~ Elizabeth Ann Brandley was born on October 4, 1928 in Raymond, Alberta, Canada. Her parents were Louis Orson Brandley and Edda Anderson Bradley. Louis Orson Brandley [BYH Class of 1914] married Edda Anderson Brandley on May 28, 1919 in Salt Lake City, Utah. The children of Louis and Edda Brandley included: Robert (Bob) Brandley, Raymond, Alberta, Canada; David S. Brandley, Ogden, Utah; W. Peter Brandley [BYH Class of 1953], Salt Lake City, Utah; Elizabeth Ann Brandley [BYH Class of 1946] (Myron Leon) Hamilton; and Margaret Brandley (Vernon Wallace) Larsen. Elizabeth married Myron Leon Hamilton on July 6, 1948 in Cardston, Alberta, Canada. Myron Leon Hamilton was born on October 18, 1927 in Savannah, Georgia. Myron died on May 6, 1995 in Arizona. Elizabeth Brandley Hamilton died on November 7, 1999. Class of 1946. Curtis A. Colvin. He graduated from BYH on May 23, 1946. Source: 1946 BYH Graduation Exercises Program. Class of 1946. Charles Moore Craven. He graduated from BYH on May 23, 1946. Source: 1946 BYH Graduation Exercises Program. Class of 1946. Lloyd L. Cullimore. He graduated from BYH on May 23, 1946. Source: 1946 BYH Graduation Exercises Program. ~ ~ Lloyd Lorenzo Cullimore married Vernice Jackson. Lloyd was born on May 16, 1927 in Provo, Utah. He died on November 24, 1987, Mount Olympus, Salt Lake County, Utah. Source. Class of 1946. Ireta De St. Jeor. [Sometimes her last name is given as "St. Jeor", but in other places it is "De St. Jeor." Her family says that since class seating and assignments were often done alphabetically she and her sisters would use different variations of their last name based on what would place them next to the cutest boys in their classes.] She served as Senior Class Secretary-Treasurer in 1945-1946. She graduated from BYH on May 23, 1946. Source: 1946 BYH Graduation Exercises Program. In the graduation program, her name is spelled: Ireta De St. Jeor. ~ ~ ~ ~ Ireta De St. Jeor was born on September 16, 1927 in Provo, Utah. Her parents were Francis Elmer De St. Jeor and Lavera Ketchum De St. Jeor. Ireta married Leslie A. Wheeler. They lived in San Leandro, California. Ireta Walker died on October 18, 1998. Her interment, Hayward, Alameda County, California. Class of 1946. Marie Dean. She graduated from BYH on May 23, 1946. Source: 1946 BYH Graduation Exercises Program. ~ ~ ~ ~ Marie was born on November 13, 1928 at Durango, Colorado. Marie was ten years old when the Charles and Myrtle Dean family moved to Provo. Marie entered the sixth grade at Joaquin School that year. She attended the Farrer Junior, then B.Y High, graduating in 1946. She graduated from BYU in 1951. She and her sister Roberta worked at Sears Roebuck part time to put themselves through college. Her brother Edwin and sister Winifred had helped each other by teaching school. Marie majored in Secretarial Practice and worked as a secretary since graduating (1957). She took 18 months out and fulfilled a mission in the Northwestern States � 1954-55. She worked more than a year at BYU as secretary to President Edwards, then followed him as his secretary in the Church Offices. Marie later married Bruce Speakman on August 8, 1958 in the Salt Lake Temple. They have three daughters and two sons. ~ ~ ~ ~ HER OBITUARY: Marie Dean Speakman returned home to her Heavenly Father on Sunday, June 9, 2013, following a long and courageous journey with Alzheimer's. She passed away peacefully, close to family, at Legacy House in Logan, Utah. Funeral services will be held at 1:00 pm on Monday, June 17, 2013, at the Kenwood First Ward Building, 1765 East 3080 South, Salt Lake City, Utah. A viewing will be held Sunday evening, June 16, from 6 pm to 8 pm, at Holbrook Mortuary, 3251 South 2300 East, and again at the Kenwood First Ward Building, 1765 East 3080 South on Monday, June 17, from 11:30 am to 12:30 pm prior to the service. The family gives loving thanks to the compassionate care provided by Encompass Hospice and the staff of the Memory Unit at Legacy House. Marie is survived by five children, Marilyn Titus, Taylorsville, Utah; Debbie (Curt) Ostrander, Smithfield, Utah; Kathy Jensen, Smithfield, Utah; Ken (Patty) Speakman, Star Valley Ranch, Wyoming; and Steven Speakman, Salt Lake City; 15 grandchildren, and six great-grandchildren (with one more on the way). She is also survived by one sister, Roberta (Bob) Peterson, Pleasant Grove, Utah; and two sisters-in-law, Gloria (Shirl) Wright, American Fork, Utah; and Nicholas Speakman, Camarillo, California. Marie was preceded in death by her parents, Charles and Myrtle Dean; her husband, Bruce; one brother, Edwin Dean; two sisters, Mildred Peine and Winifred Banks; and one brother-in-law, Lyman Aird Speakman. Marie was born November 13, 1928, in Durango, Colorado. She was raised in Red Mesa, Colorado, and Provo, Utah. She had many fond memories of her years on the farm in Red Mesa and at Brigham Young High School, where she graduated in 1946, and Brigham Young University in Provo. She served a mission for the Church of Jesus Christ of Latter-day Saints in the Northwestern States Mission. Following her missionary service, Marie worked for several years at the LDS Church Office Building as an administrative assistant during the tenure of President David O. McKay. She married her best friend and sweetheart, Bruce Speakman, in the Salt Lake Temple on August 8, 1958. Marie was a beloved full-time mother, raising five children, and then returned to the workforce from 1978-1995 in the accounting department at Murdock Travel. She was devoted to her family and to serving the Lord her entire life. Bruce and Marie raised their family in Kenwood First Ward, Salt Lake City, where Marie continued to live following Bruce's death in 2007. In 2011, she moved to Smithfield, Utah. Marie served faithfully in many church callings, including Primary President and Relief Society President. She also devoted thousands of hours to family history work. From August 1991 - August 1993, Bruce and Marie served as service missionaries in the Utah Salt Lake City Granite Park Mission. At her passing, Marie would ask all those who love her to celebrate her life, rather than mourn her death, by giving Christ-like service to those around them - a pattern Marie exemplified always. Messages for the family can be posted at: www.HolbrookMortuary.com [Deseret News, Wednesday, June 12, 2013] Source. Class of 1946. Lola Maxine Fifield [or less likely, Fiefield]. She graduated from BYH on May 23, 1946. Source: 1946 BYH Graduation Exercises Program.